In April 1942, Bath suffered enormous devastation at the hands of the Luftwaffe. More than 19,000 buildings were destroyed or damaged and over 400 people killed, many of them women and children. Yet contemporary Bath bears almost no sign of this destructive period in its recent history -- it appears to be an elegant and intact Georgian city. Unlike other cathedral cities such as Coventry, at the start of the new millennium Bath had no memorial to the city's sufferings and bravery during the Second World War. And sadly, it won't be long before there is no one left who remembers the sacrifices the city made to help bring about the post-war world we take for granted. There is a Book of Remembrance in Bath Abbey viewable in a glass case, though many people are not aware of it. There are a few dedication plaques around Bath (for instance, at the entrance to the gardens in Queen Square). Some names of residents were recorded on the War Memorial, but only those employed on Civil Defence duties. There was no memorial to remember the children, wives, and other non-combatants known as the Home Front. 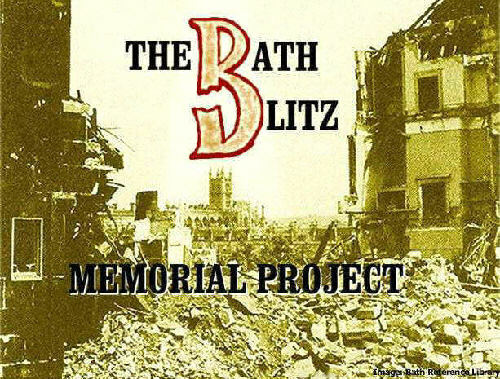 The Bath Blitz Memorial Project was founded in 2001 by a group of people who were concerned that there was no memorial to remember the names those who died when Bath was bombed, and that all traces of those days were fast disappearing and memories of Bath's role in the Second World War were being forgotten. To create a fitting memorial bearing the names of those who died in the air raids on the city. To create an educational resource for future generations before memories fade. To save the only building in Bath still bearing obvious scars of the Bath Blitz. To campaign for a museum in Bath that covers the whole of the city's history. In April 2003, a memorial was installed alongside the existing war memorial at the entrance to Royal Victoria Park. (If you are not familiar with the location, this map will help). The unveiling ceremony, conducted by the Mayor of Bath, took place on the 61st anniversary of the Bath Blitz. In April 2004 and each year afterwards, there was a memorial service on the nearest Sunday to the anniversary of the Bath Blitz. The Project collected a number of historical facts and personal memories and created a set of display panels for public display, with or without a small collection of wartime artefacts. So far, the exhibition has been shown in the Museum of Bath At Work (twice, the first time in April 2002 to coincide with the 60th anniversary of the bombing), in the Exhibition Area of Bath Central Library, and in the Community Hall of St Bartholomew's Church. When the opportunity arises, this exhibition can be quickly mounted again for public display. In September 2002, the Project's website started to be expanded to include historical information for educational purposes, and additional information has been included at intervals since then. This version is just the latest and most detailed update. Members of the project assisted a production team from 1st Take Video to prepare a video called "Bath at War" which was given Launch publicity in November 2002. The Project's share of royalties from this video funded the production costs of the educational material provided to Bath schools. An Educational Resource Pack was distributed free of charge to each secondary school in the Bath area at the end of April 2005. Another (different) Educational Resource was distributed free of charge to each primary school in the Bath area in June 2005. In May 2002, The Project was successful in getting the old Labour Exchange on the corner of James Street West and Milk Street listed by English Heritage as a Grade II Listed Building, thus protecting it from casual demolition. The Project has suggested (so far unsuccessfully) that this building could be used for a museum. There remains an unfulfilled need for a Museum of Bath. The Roman and Georgian eras were not the only ones worth remembering. The medieval period, the civil war, the Victorian slums and the two world wars are of equal importance. The Project's exhibition material is available if such a museum is eventually set up. In April 2006, our treasurer, Joy Stockley, asked that somebody else took over that role. Jim Warren volunteered, and to provide a clean start to his accounts, opened a new bank account, so that Joy could close the previous account, transfer the balance and have the closed accounts audited. That audit is now complete and the old accounts are closed. If any Project member wishes to see the treasurer's and auditor's reports, please contact Jim Warren, using this link.